Due to the never-ending quest for the dietary equivalent of the holy grail, the american diet is ever changing. For decades low fat diets were touted as being healthy until those darned omega fats proved important to cardiovascular health, the rate of obesity increased and the general health of our population continued to decline. While it’s widely accepted that some fats are essential to a healthy diet, the FDA has not kept pace with nutritional science. As such, the FDA continues to mandate that foods labeled ‘healthy’ must be very low in fat. On the flip side, many products engineered to be low in fat are instead jam packed with sugar and refined grains making their ‘healthy’ claims more than a little suspect. The WHO suggests that women should not consume more than 6 tsp of sugar a day, and men 9 tsp. To put this into perspective, every 4 grams of sugar is equivalent to 1 tsp equating to 24g for women and 54g for men (as a reference point, 1 cup of orange juice has 21g of sugar). 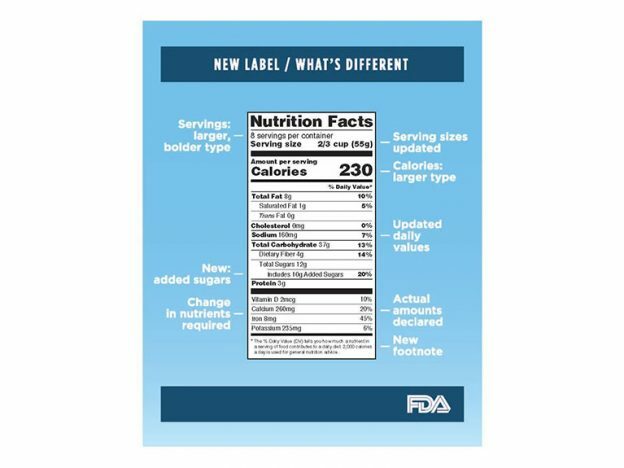 With the growing awareness that sugar has negative health consequences and that not all products containing fat are unhealthy, the FDA is attempting to address its labeling requirements in order to aid us, as consumers, in being more informed. Inside scoop: Plant based fats, such as nuts, seeds, olives and avocados are considered healthy. Sugar is not healthy. The FDA is in the process of figuring out how best to communicate this via food labeling. Food labels.. That brings me to my next topic. 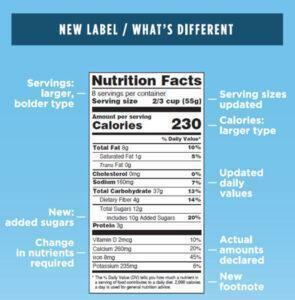 Within the next 3 years you will start seeing a new food label. This is the first big change since 1994 (woah, 22 years!) in which almost half of that was working on getting this policy passed. What’s the big change? ADDED SUGAR. With adding this to the label their hopes are that companies will reduce the amount of added sugar in their products. Just like when trans fat was being regulated, more than 80% of trans fat has been cut from processed foods. Another difference, serving sizes. With the increasing portion sizes we are now eating, labels will be closer to what an average American would consume. For example, a pint of ice cream used to be 4 servings, now it will be roughly 3. With the hopes that people will be rattled on the increasing calories and choose to lower portion sizes. So, what is your definition of “healthy eating”? Why is eating healthy important to you? Where does your sugar intake compare to the recommended value? Being conscious of the foods that we eat will have a greater impact on how we look and feel with almost anything else we can do.. Next time you go to buy something take a minute to dissect the label and know exactly what is going into your body. This entry was posted in Eating Strategy, Healthy Lifestyle, Inspiration, Menu, Nutrition, Resources, Uncategorized and tagged change, food label, Healthy Lifestyle, nutrition.